Disclosure: I was compensated for this post. All opinions expressed on this blog are my own. For as long as I can remember, Christmas has always been a magical time of year. Even now in my mid 30s, I still get goose bumps listening to Christmas music and looking at the pretty lights twinkling on our Christmas tree. I’m glad that feeling has stayed with me over the years. I get misty-eyed thinking about the wonderful memories of my childhood Christmases and hope that my girls will think back the same way I do when they are my age. The excitement always started when my mom asked my sisters and me to help decorate the tree. We usually did that a few weeks before the big day and it always signalled to me that Santa would soon be here. My parents put very few gifts under the tree prior to Christmas day because my naughty sister would always peek to see what was inside. She was talented at unwrapping gifts and then re-wrapping them to make them look untouched. Then she would tease me and say that she knew what I was getting for Christmas from Mom and Dad. Finally, my mom caught her in the act, so from then on we had to wait till Christmas morning to see all the gifts. It was pretty much bare under the tree till Christmas day thanks to my sister! In the end, it all worked out for the best. 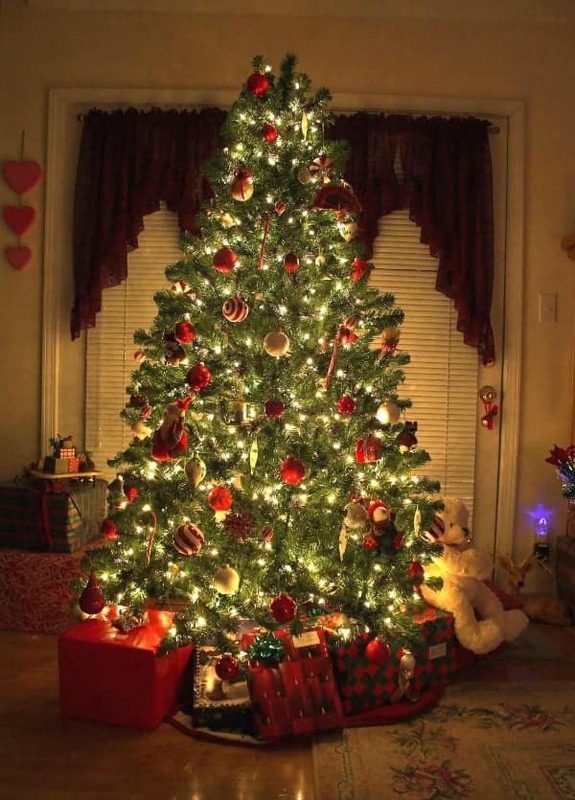 On Christmas morning, I’d run downstairs to see what Santa brought and see all the gifts under the tree. My little heart would be racing and I remember wanting to jump out of my skin in excitement for my parents to hurry up and get out of bed so I could open all the presents! We had to wait till at least 7:30 a.m. and then could wake up my parents up to open them. Let me just say that time seems to drag on and on when you are 10 years old. When my parents were up and had coffee in hand (I totally understand why they needed one now! ), my sisters and I had to do the obligatory photo of us three girls posing front of the Christmas tree with all the presents. Then it was time to open them! My sister, Laura, the stealthy gift opener, opened her gifts painstakingly slow. It would take her five minutes to open one gift—or at least it seemed that way. Meanwhile, I was the complete opposite tearing through wrapping paper like there was no tomorrow. My mom always had us write letters to Santa with our wish lists. She would give us the Sears Wish Book and asked us to circle the toys we wanted for Christmas. She told us that it helped Santa know what to bring us. I hoped that Santa would see that I’d been a good girl all year and bring me a few of the toys I asked for. 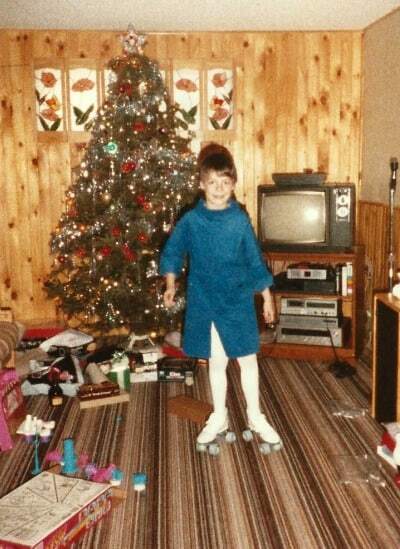 I vividly recall wanting a pair of roller skates so badly when I was about 10 years old. This was the 80s and roller skating was the cool thing to do. My older cousin had roller skates and I desperately wanted a pair of my own so I could go roller skating with her. I’ll never forget the exhilaration I felt opening that particular gift from Santa under the tree. I ripped open the wrapping paper like I always did and inside waiting for me was the prettiest pair of white roller skates with baby blue wheels. I immediately had to try them on and set the other gifts aside. I skated around the basement showing off my “moves.” I don’t think I took those roller skates off that entire holiday, except to sleep and have a bath. I wore those roller skates until my feet grew too big to wear them. I bet my parents still have them somewhere in their basement. It would be neat to find them and see if they fit my 10-year-old daughter, Bridget. I was about the same age as her when Santa delivered my pair that one magic Christmas. What Christmas gift did you yearn for as a child? I’d love to hear some of your memories! I wanted a real Barbie. I always got the knock offs LOL! Cheers for the giveaway! My gift was mall madness!! I would have done anything for it!! i wanted an Easy Bake Oven. I specifically remember asking for the Backstreet Boys Milinium CD and CRYING when I got it! Also, beanie babies. Those were huge. I always wanted anything a newborn baby doll with all the features including baby bottles and stroller! Cabbage Patch kids. I wanted a big collection of them. I loved Cabbage Patch Dolls! When I was little, I always wanted a puppy for Christmas. As a child, I always wanted a makeup and styling head toy! It’s silly really! But as a child I remember wanting a mickey mouse talking phone so bad it hurt. We wanted a furby. Thanks for the chance to win. I always wanted cabbage patch dolls. I always wanted a teddy bear when I was a child.Thanks for the great giveaway. When I was 12 I wanted an organ for Christmas. I got it too, of course, and that was also the Christmas I found out about Santa, courtesy of my sister. She led me out of our room and that is when I saw the organ being put together by my brother and father. 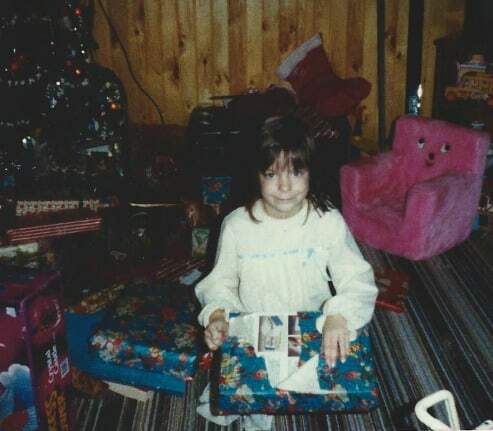 My best gift was the Barbie camper!! I wanted it so bad!! I got so many hours of joy out of it and so many years!! Such simple times.